Italian meringue is a bit trickier to make than French or Swiss meringues, but Italian meringue is very stable. 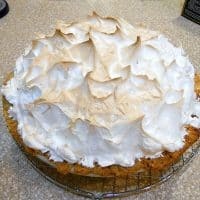 Since it is made with sugar syrup that has been taken to the soft ball stage, it won’t weep and deflate upon sitting like other meringues, which makes it Perfect for topping a pie. You can use it straight-up as a nice airy cake frosting, top a pie (brown before serving), or use it as the base for Italian butter cream. *When working with sugar syrup, have a bowl of ice water right near you in case of splashing.” Nothing burns like a sugar burn, friends. If it gets on you, resist the urge to put the burned part in your mouth. You’ll just have a burned mouth, too. Hence, the ice water. (Thank you, Derek, for that excellent tip). After the recipe, check out a step by step Italian meringue photo tutorial. This takes some timing and a candy thermometer. Put your whites in the bowl of a stand mixer fitted with the whip attachment. 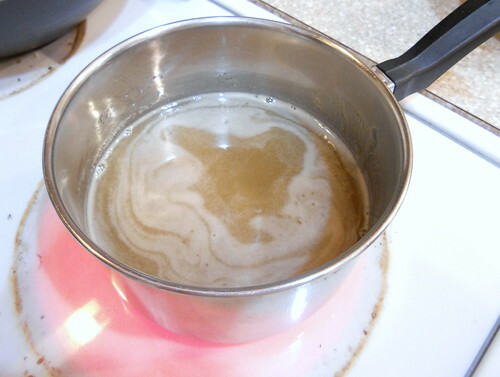 Put your sugar, corn syrup and enough water to make things wet in a heavy-bottomed pot on the stove. Stir to get things going, then bring the mixture to a boil. 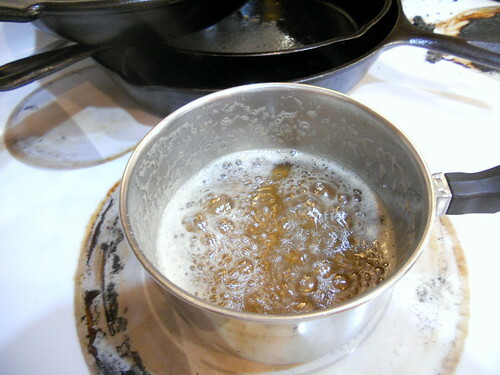 Cover the pot with a lid or a piece of plastic wrap and let boil for 2-3 minutes to clean the sides of the pan of any errant sugar crystals. Take off lid/carefully remove plastic wrap. Plop in your candy thermometer. No more stirring. You’re shooting for 244 degrees, F. (You can go to 240, but I’m partial to 244). 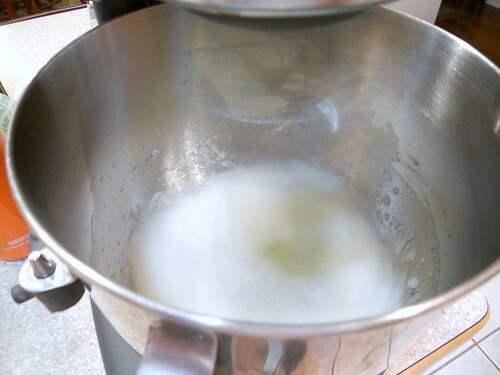 When the sugar syrup reaches about 225 degrees, start whipping your whites. 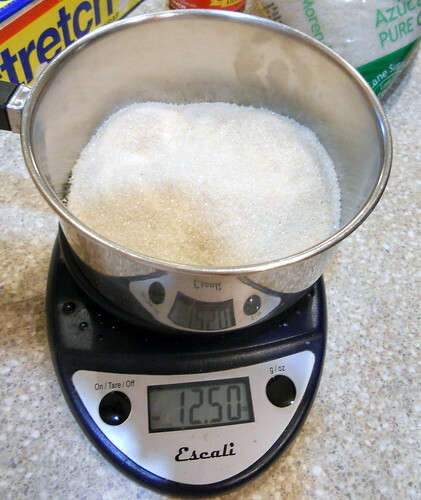 Ideally, they’ll be at medium peaks when your sugar reaches 240-244. You might need to play around with this a little bit. 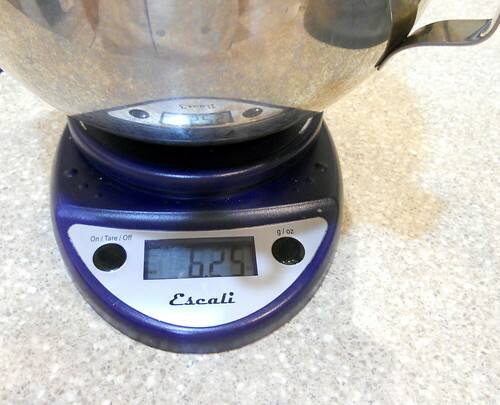 When the sugar is about 2 degrees cooler than you want it, carefully remove from the stove, turn the burner off (I forget, sometimes), and turn the mixer speed down to medium. 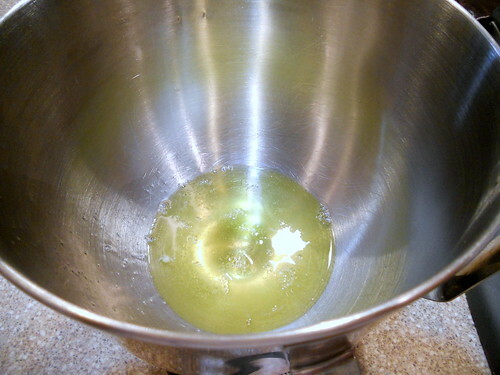 Steadily pour a thin stream of the sugar syrup down the inside of the bowl. Pour slowly enough that you don’t splash syrup on the whisk, thereby shooting molten sugar all over the inside of the bowl and not in your meringue. When all the syrup is in, crank that puppy back up to high speed and whip until cool. Add flavorings, and there you have it. Italian Meringue. Yay! Here’s your photo tutorial, as promised! Put whites along with a pinch of salt in your mixer bowl. Weigh your whites. I was a bit exuberant here. To generously top a pie, you’ll be fine with 5 ounces of egg white (or even 4). Add sugar along with a touch of corn syrup (I used 1 ounce to 12 ounces of sugar) to equal twice the weight of the whites. No need to worry about an exact measurement of corn syrup here. A glug will do. Add enough water to the sugar/corn syrup mixture to get things wet. Bring up to a boil. When it boils, cover to let any sugar crystals wash off the sides of the pan. I used a natural sugar, so the impurities made it bubble way up and then rudely spill over. If you’re going to use a natural product, keep a close eye on it. 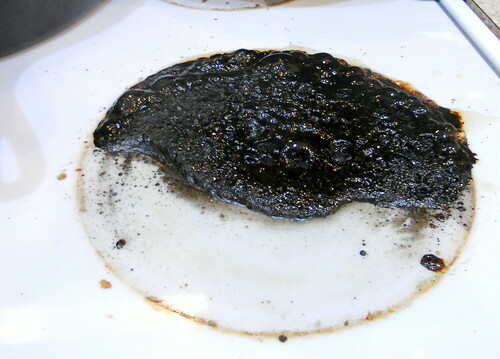 You may even want to just brush down the sides of the pan with water rather than covering it and risking a boil over. If you do make a mess, turn off the burner. You won’t be able to do anything until it cools off, so open all the windows (it will be smoky in your house), put a fan in the window and Carry On. You can clean it up when it cools down. Ignore the mess on the other burner and continue boiling over medium high heat. 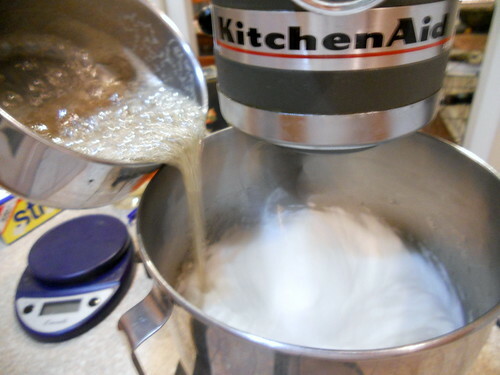 Once your sugar syrup has reached about 235F, start whipping your whites on medium-high speed to get them nice and foamy. Your target temperature is 244F, so keep an eye on it. Once it has reached about 242-3F, turn off the heat. Pour your syrup into your beating egg whites in a steady stream. 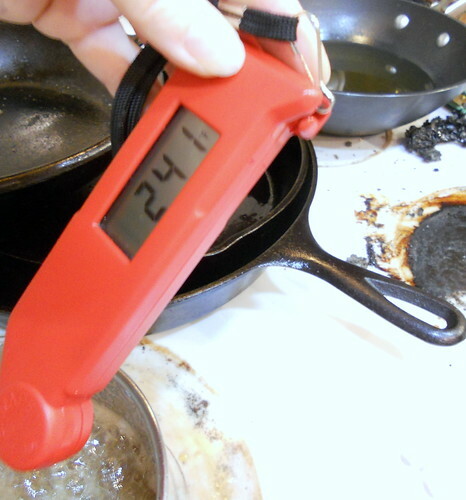 By the time you move your pan, your syrup will be at 244F, so don’t be concerned that you’re not Doing It Right. 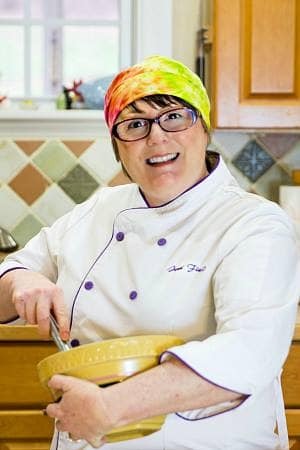 Make sure that the syrup is pouring into the bowl between the side and the madly spinning whisk so it doesn’t splatter all over the sides of the bowl. Continue beating the whites until very light and fluffy. 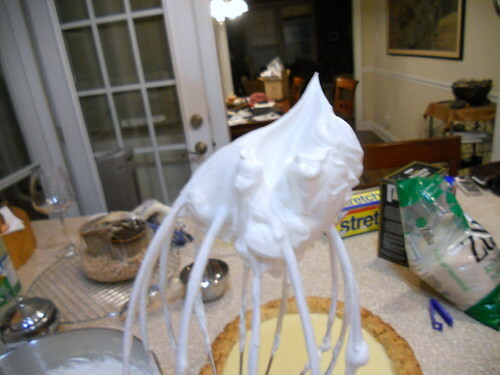 You want your meringue to be very glossy and easily hold stiff peaks. Spread it on…whatever you’re spreading it on…before it cools down as it will get lumpy if you start messing with it once it has cooled off. Use it while it is still nice and hot but not steaming. Spread it on thickly. 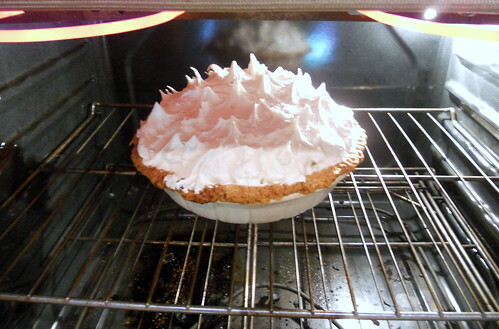 If you’re using it to top a pie, make sure that you extend it well over the crust so it won’t shrink back. It doesn’t have nearly the tendency to do that as French meringue, but it will still shrink a little if you don’t make sure it is in good contact with your crust all the way around. Make swoopies in it with the back of a spoon or spatula. Brown it under the broiler–it’ll go fast–or hit it with a torch before serving. These are affiliate links, so if you buy through here, I’ll get a few cents on the dollar to help us feed the kittens. Thank you! 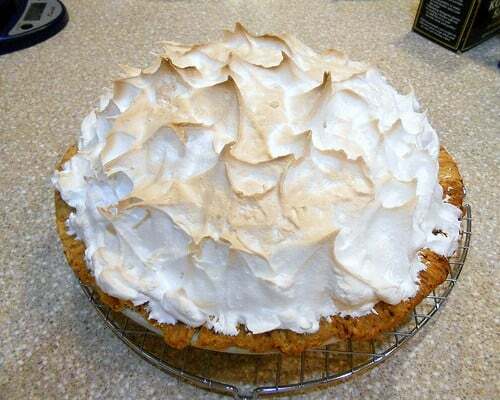 Even if you use dark corn syrup, the meringue will generally whip up very very light in color–almost white. If you want to ensure a bright white, use the light, but either will work, Elly. Thanks for stopping by and thanks for the question!